Copepod (Centropages hamatus) under a microscope! 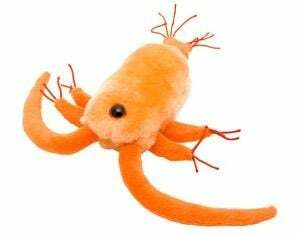 One of the most abundant, multicellular creatures in the world! Take home 1 - or 1,000! They help keep the ocean and waters clean by eating algae, bacteria, and dead matter. They also help control mosquito populations and spread of mosquito-borne illnesses by eating mosquito larvae. The word “copepod” comes from Greek roots, meaning paddle-footed, to describe their paddle-shaped bodies. They range from 0.2 to 10 millimeters, but usually measure at 1 to 2 millimeters. Copepods are tiny, acquatic animals that live in both salt and freshwater environments. They can be free-living or ectoparasites, meaning they cling onto larger animals like fish and whales. They eat other tinier organisms like bacteria, amoeba, paramecium, euglena, and larvae. 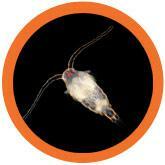 They serve as food for small fish, rotifers, and aquatic insects. Unfortunately, they can also harbor parasites, like worms and flukes. When fish eat infected copepods, they may also get infected. Copepods have been the subject of research for thousands of years. The oldest published work dates back almost 2,000 years and includes observations by Aristotle! 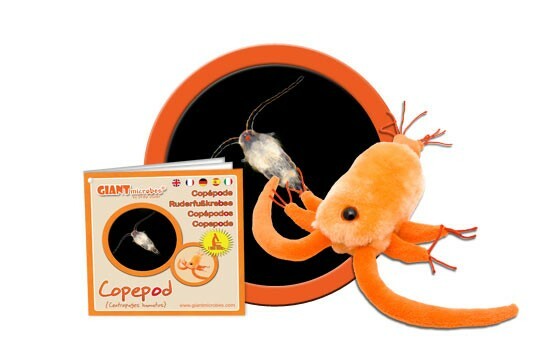 There are over 10,000 species of copepods all over the world! Copepods have the ability to encyst, or morph into a hard body. This allows them to resist drought periods when their habitat dries up. Scientists have found viable, living copepod cysts as old as 300 years!